Dr. Sharon McQuillan is a Board certified physician who specializes in both Aesthetic and Anti-Aging Medicine. Ageless Aesthetic Institute offers operational and consulting services as well as hands-on training in Aesthetic Medicine. 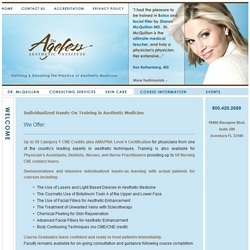 Click image to open Ageless Aesthetic Institute's website. The Ageless Regenerative Institute is an organization dedicated to the standardization of cell regenerative medicine. The Institute promotes the development of evidence-based standards of excellence in the therapeutic use of adipose-derived stem cells through education, advocacy, and research. The Ageless Regenerative Institute’s Stem Cell Training Program is a multi-faceted innovative program designed to address all areas of procedure implementation, including education, operations, equipment, compliance, and marketing. Click image to open Ageless Regenerative Institute's website.